Most of us have seen the Running of the Bulls on TV but few of us really understand what this crazy annual ritual is all about. It looks like a bunch of (mostly) guys wearing red and white who seem to be frantically running down a narrow alley either in front of or beside a bunch of extremely large cattle that have gigantic horns! Until this past year I had never given much thought to this odd Spanish institution, writing if off as one of those puzzling European traditions that we occasionally hear about, like Germans during Oktoberfest swilling beer in their lederhosen. Back in March of this year, I was browsing the vast expanse of web-based travel sites, searching for vacation ideas and hoping to perhaps spot a few summer airfare bargains. It didn’t take long to realize that summer airfares to Europe were running at least fifty percent higher than last year, so it seemed that regardless of which destination I chose, if it involved travel across the Atlantic, it seemed sensible to plan for a somewhat longer timeframe. After all, if you’re going to spend eleven hundred dollars to travel from San Francisco to London or Paris, you might as well stay longer and get your money’s worth. Of course, many Americans cannot get away from work for more than a week or two, so spending a month or so abroad is simply not possible. I have always believed that doing too much or trying to cover too much ground in a short period of time is a bad move, and often lends itself to a negative travel experience. If I only had a week, I would just as soon fly to Hawaii and spend some time relaxing on a beach and doing some island exploration. In fact, one of the greatest thrills of my life was hiking after dark to the lava flows of Kilauea and seeing the glowing lava up close. Friends who have made the trek to Europe and back in one week have confirmed that it makes for an exhausting trip, especially with the jetlag that leaves you cranky and irrational. And as for Asia travel, getting to Tokyo can involve a fourteen hour nonstop flight combined with a seventeen hour time change—now that’s truly a killer! If you want to travel halfway around the world, I think its best to plan for a minimum of two weeks, and longer is definitely better. On arrival, I would recommend allowing yourself a day or so to adjust to the time change before getting into serious sightseeing mode. Don’t spend the entire first day sleeping or you’ll be up all night, but perhaps a short nap (a couple of hours if you’re really exhausted), followed by some limited exploration in the immediate vicinity of your hotel, is a good start. So this year, Teresa, my favorite traveling companion, wanted to plan a vacation that would be “different.” More specifically, she wanted to go somewhere we had never traveled to previously and try something we had never done before. As such, this prerequisite excluded a lot of terrain, and what first came to mind was Eastern Europe. During our first few years traveling together, Eastern Europe was behind the Iron Curtain, and travel into the Soviet bloc was exceptionally difficult and, quite frankly, not very appealing. However, since the fall of the Berlin Wall, Prague and Budapest have become among the leading tourist destinations, and in fact, are rapidly becoming clichéd. Nonetheless, the Czech Republic, Hungary, Poland, and even the Baltic states of Lithuania, Latvia and Estonia hold a certain appeal, and I must confess to considerable curiosity about Lithuania, as my paternal grandfather left his hometown of Vilnius at the turn of the last century to find his fortune in America. I stopped by our local public library and picked up copies of several travel guides, including Lonely Planet, Frommer's and Fodor's. Although travel-related websites are undoubtedly a valuable source of information, when it comes to actually planning a trip, reviewing several of the more popular travel guides is a useful exercise for acquiring some insight and perspective vis-à-vis potential travel destinations. In the meantime, I continued to regularly scan the web for airfare bargains. About two weeks after starting my search, I stumbled across an on-line airfare that was so low it had to be an error. This type of error does happen occasionally, and if you book the fare quickly before it is corrected, the airline will usually honor it. In this case, the round-trip airfare was $661, San Francisco to London (including all taxes), for peak travel in July. After a quick call to Teresa, I booked the fare even though we didn’t have any idea as to how we would use it. Spotting a bargain on-line required quick action since great deals can disappear in a matter of minutes, and London is a reliable springboard to other European destinations. “What about Spain?” I suggested one day. The truth is, I don’t recall what prompted me to suggest Spain as a destination. We had both perused Frommer’s guides to the Czech Republic and Hungary, and neither of us had experienced the requisite spark of anticipation. In fact, I had trekked through Spain in the fall of 1977 and had found it to be rather lackluster. Franco had been dead for less than two years and Spain had yet to fully emerge from his repressive rule. I swung by the library again and brought home copies of Frommer’s Spain and Rick Steves’ Spain and Portugal. 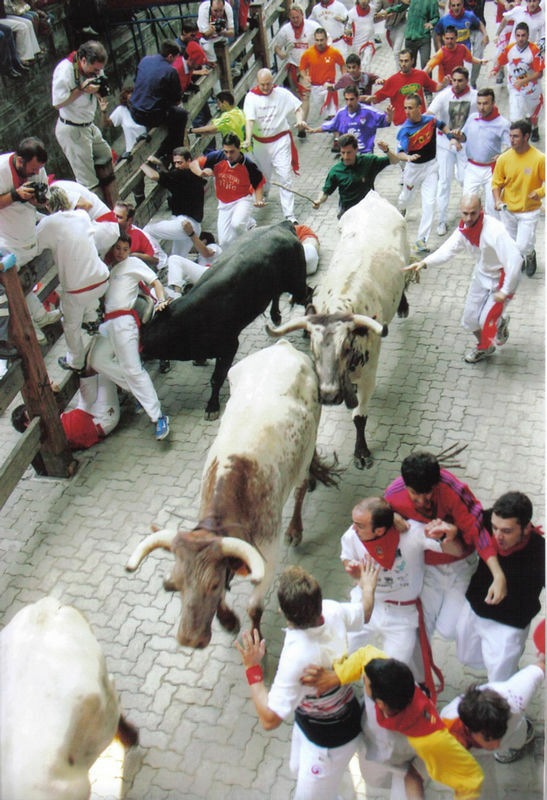 Later, while thumbing through Frommer’s, I chanced upon a fascinating description of the Running of the Bulls in Pamplona during the Fiesta of San Fermin. Now THAT would be different! The article stated that the fiesta was held each year from July 8 through July 14, and that the bulls ran every morning through central Pamplona at 8 AM. Why not plan a Spanish itinerary starting with Pamplona? We had found our spark! Pulling together an itinerary is one of the most difficult aspects of planning a trip abroad. Because your time is finite, you cannot do everything. Tough decisions must be made. Although you can seek guidance from a variety of travel guides that are available, the problem is that most of these guides are insufficiently selective. If you only have a day or two in a given location, how do you determine which of a dozen listed cathedrals or museums is really worth your time? And while most guidebooks rate the sights they list, they rarely prioritize, so deciding what to see and what to skip can quickly become a dilemma. I think its important to consult several different travel guides when planning a trip. However, since I believe that traveling light is essential, my advice is to choose only one guide to take with you. I prefer either Lonely Planet or Frommer’s since they are both comprehensive. The former is directed toward budget travelers while the latter tends to be more high-end. On the other hand, Rick Steves’ European travel guides, while less comprehensive in scope, are much more selective about where to go and what to see. In addition, I find it helpful to seek on-line sources of information using Google as my preferred search engine. Having settled on Spain as our summer destination, I relied heavily on a newly purchased copy of Rick Steves’ Spain 2006 to develop our itinerary. Because Rick Steves’ guides are revised annually, the information they provide is as accurate and up-to-date as possible. Here is what our itinerary ended up looking like: San Francisco – London – Vitoria – Pamplona – Barcelona – Seville – Granada – Cordoba – Madrid (Toledo) – London - San Francisco. For air travel within Europe there are a variety of discount carriers, the largest of which are EasyJet and Ryanair. Both serve a variety of locations within Europe and prices are extremely reasonable. The downside is that they often fly in and out of airports that are somewhat off the beaten track, i.e., London Stansted or London Luton. We traveled from London to Vitoria (which is about a one hour train ride from Pamplona) on Ryanair, and returned to London via Madrid on EasyJet. 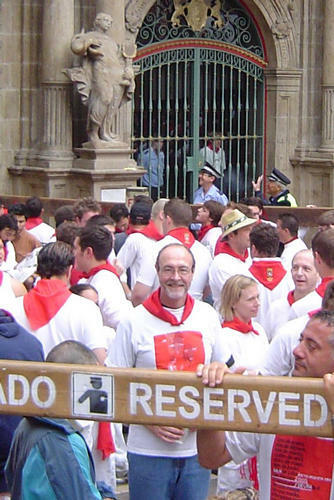 It was Ernest Hemingway (in his novel The Sun Also Rises) who popularized Los Sanfermines—The Fiesta of San Fermin which occurs annually in Pamplona during the early part of July. From its local origins as a religious festival to honor a local saint, it has evolved into a world-renowned round-the-clock celebration and street party that attracts tens of thousands of foreigners who want to experience the fiesta as Hemingway described it. The fiesta kicks off at noon on the sixth of July in the square in front of City Hall, within the old town of Pamplona. We arrived in Vitoria on the eighth of July following an unremarkable flight on Ryanair. The town seemed quiet when we arrived at our hotel, the Ciudad de Vitoria (http://www.hoteles-silken.com/vitoria_ciudaddevitoria_presentation/presentation.php/2/0/0/0/1/ENG/) and after getting settled, we headed back out to scope it out. At about 8 PM we noticed that more and more people were materializing on the streets and in the open air plazas, with small crowds clustered in front of the many tapas bars. This, we ascertained, must be the traditional “paseo” we had heard so much about, an evening ritual where much of the population emerges to stroll the streets prior to enjoying a (very) late supper. We came across a tapas bar that was especially crowded, so figuring that this was a good sign, we went in. There was an amazing array of tapas, which are basically stacks of appetizers that you can purchase individually, usually 3 or 4 items per order. Rioja (red wine) was the beverage of choice offered in small glasses of perhaps 2 to 3 ounces. Most of the tapas and the wine cost only about a Euro per order (about $1.30 U.S.) We tried several unidentifiable dishes, not knowing what we were getting as neither of us understands Spanish. Some tasted delicious, others were horrendous. We were still somewhat jet-lagged when we headed back to the hotel and crashed. We were astonished to wake up at 11:45 AM! By 3 PM we were on a train bound for Pamplona. Using the Sanfermines website, we had arranged to stay at a private home while attending the fiesta. Check it out at http://www.sanfermin.com Since most of the hotels are fully booked many months in advance, there is a bulletin board where you can post a free ad for lodging. We had connected online with Isabel "Mabel" Eschevarria, and she was kind enough to meet us at the station and take us to her home. Not wanting to waste time, we headed to the festival. Mabel was adamant that we dress appropriately and provided us with red bandanas and told us to buy some white T-shirts ASAP. By the time we arrived it was after 6 PM and there was a huge crowd in front of the Plaza de Toros. It was a stroke of good fortune when a group of men representing one of the many Peñas (clubs) that hold blocks of tickets to the bullfight offered us seats at face value, only €50 for two. What a spectacle! The stadium was abuzz with excitement, packed with thousands of wildly enthusiastic fans decked out in the red and white festival colors. At first we didn’t know what we were watching for, but as the matches progressed we began to see that the different matadors possesses varying degrees of grace and expertise. We were surrounded by the Peñas who shrieked Olé! Olé! whenever the matador did good and threw tomatoes and an assortment of items whenever he did bad! It was a gory spectacle and we figured that the PETA activists back home would have had a cow (no pun intended) had they seen it. Afterwards, we headed into the streets along with the rest of the crowd, many of whom had apparently been drinking copious amounts of Rioja and beer throughout the bullfight. All of the Peñas had bands and they paraded up and down the streets of the old city blasting raucous music into the crowds, drinking and partying well into the wee hours of the morning. After watching a spectacular display of fireworks at midnight, we made our way back through the crowded narrow streets, diligently avoiding getting splattered by drunken revelers throwing back beer and Rioja, finally calling it a day after 1 AM. We got up at 5 AM and made our way to the bus stop while it was still dark. The street was deserted and we thought we were the only ones up, but when the bus arrived, it was completely packed and everyone, including a couple of elderly grandma-types, was dressed in red and white. By the time we made our way to the Encierro (the route), there were throngs of people and we fought to get a decent vantage point on top of the six foot high railings that enclose the run. We immediately spotted Peter and Ari who were pacing nervously with their rolled-up newspapers. Peter explained that having a rolled-up newspaper was part of the tradition and we noticed that most of the other runners had them also. Ostensibly, the newspaper is to distract the bull if it gets too close, explained Peter. Right. Like a newspaper is going to protect you from a charging, panicky, eleven hundred pound animal! Ha! There were swarms of medics and police, as well as TV cameras to record the mayhem all along the route, which is actually only about a kilometer. At two minutes before eight a warning alarm sounded, and at exactly 8:00 AM the blast of a cannon signaled the start of the run. Within seconds, crowds of runners went flying by and were followed almost immediately by the charging herd of bulls. Some runners tried to touch the bulls as they sped by, some dove sideways through the railings to get clear, several fell to the ground and were trampled by other runners, and a couple of lunatics tried to keep pace a few feet in front of the charging lead bull. The entire run lasted perhaps 10 minutes, with the herd of bulls as well as many of the runners eventually emerging from the Encierro into the Plaza de Toros. With throngs of runners and spectators clogging the narrow streets, we didn’t try to find Peter or Ari right away, figuring that we would run into them later. We headed over to the designated area by the bus station, and after a few minutes the Big-Heads began to emerge from a large portal, forming a slow procession. They varied in size, and several of the larger ones, including a king and a queen, towered over the crowd. They were expressionless, kind of like oversized versions of Mr. Roger’s King Friday the 13th and Lady Elaine Fairchild. There were also several somewhat smaller Big-Heads that wandered among the crowd, chasing and bopping children on their heads with a foam bat while the children cackled with laughter and tried to get away! Their parents got bopped too if they tried to interfere! Although the fiesta continues around the clock, by mid-afternoon we noticed a lull in the activities. It seems that those who arrive early in the morning to catch the Running of the Bulls, i.e., the day shift, congregate at the local cafés and bars and settle down to await the evening bullfights. And as the evening approaches, the Peñas and all-night revelers, i.e. the night shift, begin to reappear. A crowd slowly materializes outside the Plaza de Toros, growing steadily larger as the appointed time draws near. By late afternoon, having started our day before dawn, we were worn out. Choosing to forego another evening of revelry, we headed back to Mabel’s home for some down time. Once again we rose before dawn. Runners were already congregating along the Encierro by the time we arrived. Much to my relief, I spotted Peter and Ari milling about, newspapers in hand. If they hadn’t been there, I’m sure I would have lost my nerve! A cluster of medics with bright red crosses plastered across their vests loitered by the enclosure and I eyed them apprehensively. Teresa immediately climbed the railing and battled for a prime viewing spot while I went off in search of a newspaper to fend off the bulls! With eight o’clock rapidly approaching, the buzz of the crowd began to escalate as the runners staked out their positions. When the two minute warning sounded, my adrenaline surged, giving me a sudden case of the jitters! Suddenly there was the boom of the cannon. I craned my neck to see what was happening, and within seconds I spotted the herd of bulls barreling toward me. I began to run, immediately tripping over several other runners. I struggled to keep my balance. At first the bulls were far behind me, then abruptly they were beside me, and then suddenly they were gone. 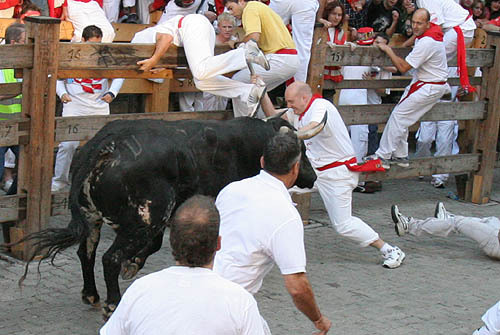 As the bulls charged into the distance a crowd of spectators surged onto the Encierro. Teresa and I quickly moved to the adjacent plaza where a giant screen was showing footage of the bulls already entering the stadium. Moments later the scene switched to an instant replay, and we watched in horror and fascination as a runner who had stumbled, his face brutally smashed into the cobblestones by the crowd of runners, was quickly hoisted by medics into a waiting ambulance. Seconds later, siren blaring, the same ambulance sped past us through the plaza! Up next: Barcelona and beyond! Running with the bulls is not as dangerous as it sounds. You have a better chance of getting trampled by the other runners than of getting gored by a bull. But it sure is exhilarating. While in Pamplona I met Peter Milligan and Ari Deutche, Americans from South Jersey who head to Pamplona every year to run with the bulls. Peter, pictured above, convinced me that it was not that dangerous. Although my run was pretty benign, its hard to say the same about Peter's.